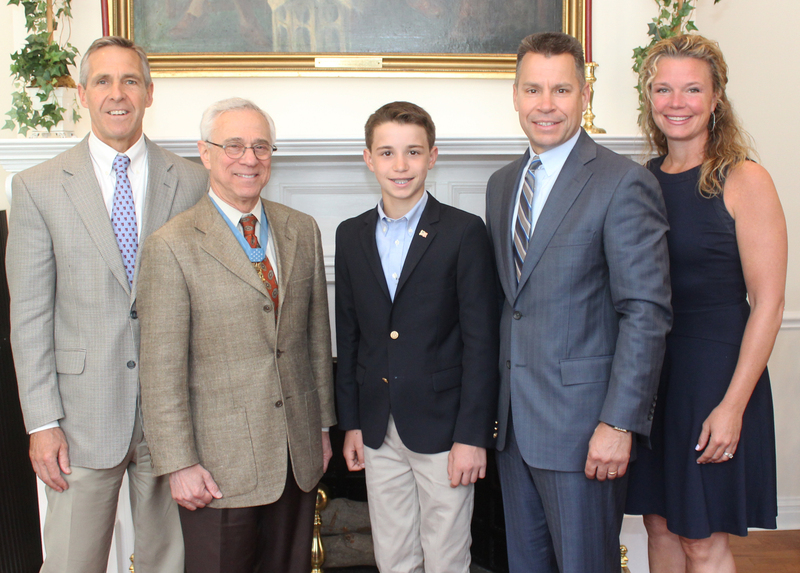 With Memorial Day weekend approaching, the Morristown-Beard School community was fortunate enough to host a special Morning Meeting event featuring Colonel Jack Jacobs and Mr. Bob Jerome of the Congressional Medal of Honor Foundation. A recipient of the Congressional Medal of Honor, and a current NBC and MSNBC military analyst, Colonel Jacobs spoke to the MBS community about service, character, and citizenship. Colonel Jacobs is a retired colonel in the Unites States Army who received the Congressional Medal of Honor from President Richard M. Nixon for exceptional bravery in Vietnam. During a mission in 1968, Colonel Jacobs saved the lives of 14 individuals despite injuries to his head and arms, repeatedly running back into enemy fire to rescue these men. Colonel Jacobs also received two Purple Hearts, two Silver Stars, and three Bronze Stars for his service. Colonel Jacobs has also served his country in an academic role as a faculty member at both the U.S. Military Academy in West Point, where he taught international relations and comparative politics, and the National War College in Washington, D.C. Following his military retirement in 1987, Colonel Jacobs began a successful business career, working in investment banking, real estate development, and other related endeavors. He has had two books published, including his memoir, which won the 2010 Colby Award for a book which made “a significant contribution to the public’s understanding of intelligence operations, military history, or international affairs.” Currently, Colonel Jacobs serves a military analyst for NBC and MSNBC, and has appeared on The Colbert Report, The Rachel Maddow Show, and many other programs. MBS would like to thank current MBS parents Chris and Theresa Cook for making this event possible.